The price of bitcoin on Coinbase has moved higher in trading today. The price is up about $66 to $5157.55. In the process, the price moved above the 100 hour MA (blue line in the chart below) at $5083.11. The 200 hour MA has seen the price action (green line), move above and below the MA line. Being back above the 100 hour MA is more bullish. The level is now a risk level for longs. Stay above keeps the bulls in control, but move back below and the buyers could shift to sellers. 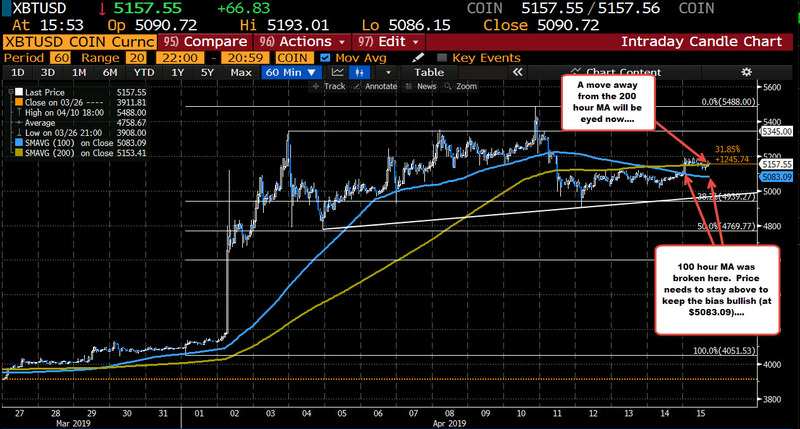 Last week, the price moved up to a high of $5488 on Wednesday, but moved below the 100 hour MA on Thursday. It remained below that MA and bottomed near $4900 on Friday. The weekend saw the price action move more up and down sideways.